Los Angeles Dodgers fans expected to consume most hot dogs this year. Like candy on Halloween, hot dogs are the quintessential summer ballpark food, and the National Hot Dog & Sausage Council (NHDSC) estimates that baseball fans will consume more than 19.4 million hot dogs and more than 4.3 million sausages during the 2016 Major League Baseball (MLB) season. The Los Angeles Dodgers of California can relish a victory as the team’s fans are once again projected to consume the most hot dogs, totaling more than 2.6 million — a jump of more than 100,000 from last year. The New York Yankees have again claimed second place, as fans are expected to consume more than 1.55 million hot dogs. Batting third are the Cleveland Indians fans, at 1.253 million hot dogs, followed closely by Texas Rangers fans, with 1.207 million anticipated hot dog sales. Fans of Illinois' Chicago Cubs round out the lineup of top hitters, with fans expected to consume more than 1.000 million hot dogs, representing a 17% increase over last year. In perhaps the greatest upset this season, the San Francisco Giants in California have unseated defending sausage champions the Milwaukee Brewers of Wisconsin to reclaim the top spot, with 475,000 sausage sales expected. Missouri's St. Louis Cardinals rose to clinch second place, with fans expected to consume 400,000 sausages. The Boston Red Sox, meanwhile, earned third place with Fenway Park fans in Boston, Mass., expected to eat 327,500 sausages this year. The Brewers dropped to fourth, with fans expected to consume 280,000 sausages. 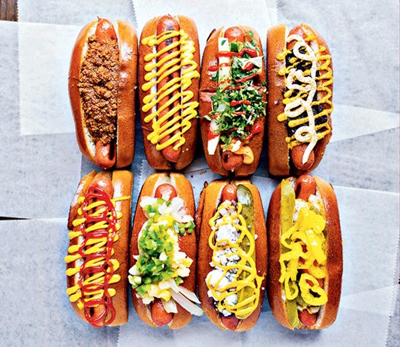 While traditional hot dogs remain perennial favorites at ballparks across America, teams are introducing new creations. With so many new options, NHDSC launched a new guide with descriptions and photos of this season’s most unique hot dog and sausage offerings, along with a sampling of classic favorites. Cracker Jack & Mac Dog. Pittsburgh Pirates fans will no longer have to choose between two of baseball’s most cherished foods: Cracker Jacks and hot dogs. This creation, offered by Aramark, features a hot dog topped with Cracker Jacks, mac and cheese, salted caramel sauce and fried jalapenos on naan bread. T.E.D. – “The Everything Dog.” Atlanta Braves fans should come hungry to eat this standard foot-long hot dog layered with fries, chili, nacho chips, beer cheese and jalapenos, topped with popcorn and Coca-Cola-infused BBQ sauce and served in a pretzel bun. Cheeseburger Dog. Arizona Diamondbacks fans can indulge in this hot dog made of char-grilled hamburgers ground up and mixed with chopped smoked bacon, green onions and cheddar cheese. The dogs are then breaded with milk and flour, deep-fried and served on a bun with smoked bacon and secret sauce. Wicked Pig. Pork-loving Texas Rangers fans can enjoy this sandwich topped with sausage, pulled pork, Danish bacon, prosciutto, ham, coleslaw and pork rinds, finished with BBQ sauce. Another trend is local hot dogs such as at Wrigley Field, where Cubs fans can enjoy new hot dogs and sausages from local favorite Hot Doug’s and Gilbert’s Craft Sausages, while the Washington Nationals are debuting a stand from local restaurant Haute Dogs & Fries, and the Cleveland Indians will feature hot dogs from Happy Dog, including one topped with Froot Loops.